Cloth Baby Diapers | Stock Up The Nursery And How To Make A Diaper Cake Green! Cloth Baby Diapers make the perfect gift to stock up the nursery. And, learn how to make a diaper cake using the best cloth diapers. Whether you're giving Mom-To-Be a gift of diapers, or being creative with a diaper cake gift, she will definitely appreciate it! Cloth diapers are available in a wide assortment of colors and types. If you're looking for a great gift to stock up the nursery for Mom-To-Be, check out all of the different, fun styles and colors available on our best cloth diapers page. For an eco-friendly diaper cake, using cloth baby diapers, keep reading to make your very own unique baby shower gift. and make her a cloth diaper cake ... It's Easy! Start with the best cloth diapers to select the diapers you'll be using for your cake. We've researched baby diaper cake instructions and found two different styles and approaches on how to make a diaper cake for your baby shower. Experiment with the two versions and try the cloth baby diapers to make a creative and unique diaper cake. Cloth baby diapers come in all sorts of colors and patterns, so you're sure to have a most unique baby shower gift. Looking For A Smaller Project ... Short On Time? Are you a little busy and don't have time to make a full blown diaper cake? Check out our Make An Easy Cloth Diaper Cake page for instructions on an easier way to make a fabulous unique diaper cake for Mom-To-Be. Besides being a beautiful center piece for a baby shower, a diaper cake is a great introduction for Mom-To-Be using cloth diapers. Using the same methods as previously noted in our "How to Make a Diaper Cake" videos ... Baby Diaper Cake Instructions ... merely substitute the disposable diapers using cloth diapers instead. Using the best cloth diapers, roll them a little tighter (like rolling a sleeping bag). This will give your diaper cake more support. Also add an extra band of ribbon around the outside, to better hold them in place. Stiffer, more durable items, such as plastic baby bottles, make a great center support for these types of diaper cakes. Another great aspect of the cloth diaper cake, is you can use cute baby safety pins to attach items, such as small stuffed animals, baby socks, booties, knit hats ... basically anything you can stick a safety pin in. Use your imagination. 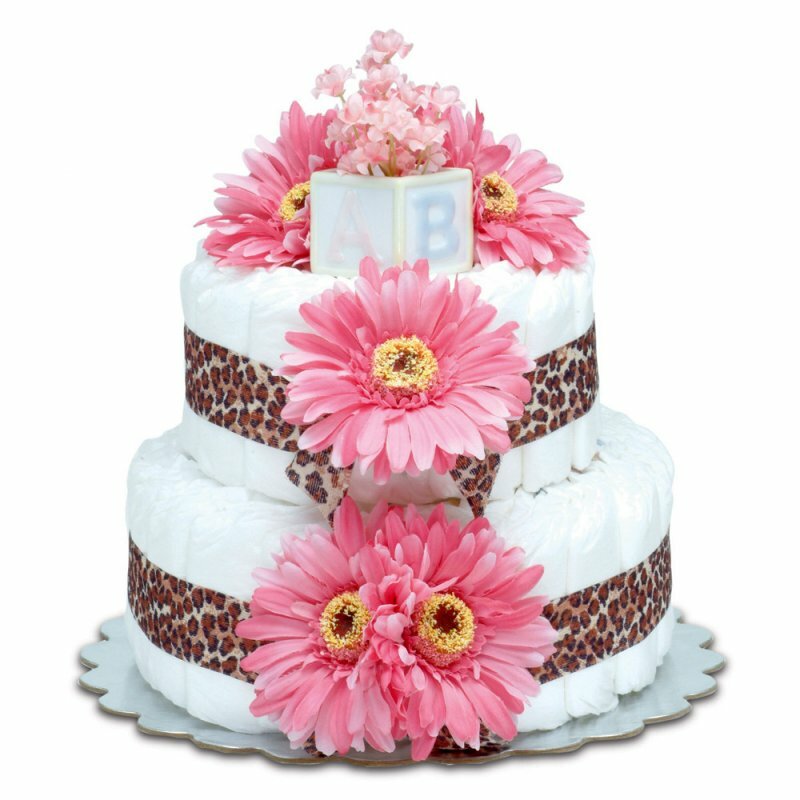 Discover loads of Baby Care Supplies and products to incorporate into your diaper cake design. Tip: Substitute for some of the cloth diapers with our burp cloths, baby pillow covers, and receiving blankets from the Unique Baby Gifts Gift Shop. AND ... don't make it too big ... remember that cloth diapers are heavier than disposables.